Your playback system embodies the critical listening environment. 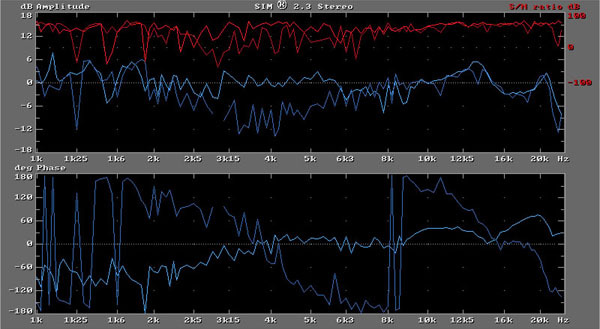 Room/speaker interface non-linearities can result in unacceptable recordings and mixes. Producers and engineers need to know that the work they take out of your room will translate to playback systems in the consumer world. Whether you have a multi-room professional facility, a small project studio, or a home theater, sound fidelity could be improved with acoustic treatments or equalizer voicing. The SIM 3 System allows me to quickly find acoustic and transducer problems and offer effective, accurate solutions. No other analysis system offers the resolution of SIM or has won the prestigious R&D 100 Award. Speaker system non-linearities, phase problems, room reflections, distortion, and system coherence (or frequency by frequency signal to noise ratio) are all important factors that I can address in real time. It sounds incredible but 25% of the rooms I have measured have some type of phase problem that has gone undetected when voiced with other systems. Results are often spectacular and final voicing can even be done with music, letting the ears combine with the analyzer for those final, artistically critical adjustments. 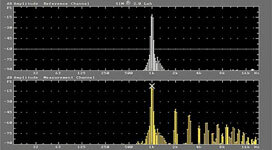 The first stage of analysis is to identify the acoustic problems. These anomalies, especially first order reflections, should then be treated to create a large, even listening "window" in a room. It can be very effective to employ acoustical means such as adding absorptive or diffusive materials. The data gathered by SIM can guide such choices. There are practical limits to treating bass problems though and in some smaller rooms, minimum phase parametric equalization can be much more cost effective than bass trapping. Stage two is the application of equalization to fine tune the system into the room. This results in all speakers being extremely well matched, increasing imaging and depth. It also allows the application of a preferred curve or specific standard such as an X-curve. Here are some examples of what SIM can address. Problem: Polarity reversals and poor time alignment can cause unequalizable holes in your system's response and endanger components. Improper alignment will result in poor center imaging, aggressive high end, lack of bass, and hollow vocals. Solution: By viewing your system's phase and coherence in real time, polarity problems can be quickly spotted and corrected. Problem: Frequency response anomalies result in poor translation of mixes. Solution: Equalizing a monitor system requires precision. 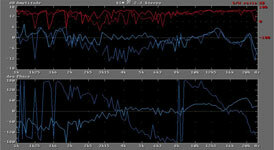 SIM displays your system's response from 8 Hz to 22 kHz with 1/48th octave resolution. By measuring and displaying the speakers and equalizer simultaneously, the desired response can be acheived quickly and accurately. Overlaying the left and right speaker responses allows perfect matching, for a stunning center image and sound that does not change with panning. While viewing system coherence, accurate equalization decisions can be made regarding the effects of destructive reflections. Problem: Reflections from control room surfaces can have serious detrimental effects on your monitor system's response. 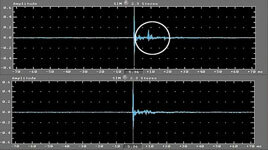 Solution: The SIM Delay Finder can quickly identify these problem spots so that acoustical solutions may be applied. Also, staggered component time arrival and a smeared impulse response indicate problems that often go undetected with other measurement systems. SIM displays time arrival accurate to within +/- .02ms. 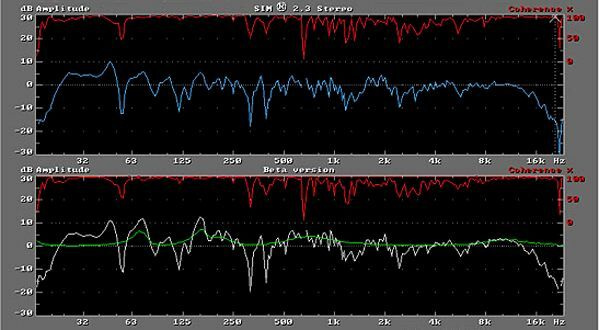 Problem: Harmonic distortion adds coloration to your audio signal and hurts the ears. 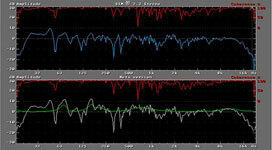 Solution: Tracking harmonic distortion over time identifies when components become fatigued. This can save you money, since it prevents replacing components before their time is due. Additional information about SIM 3 and downloads are available on the Meyer Sound site. Examining the Yamaha NS-10M "Tissue Paper Phenomenon"
Copyright © 1998-2011, Bob Hodas Acoustic Analysis. All rights reserved.